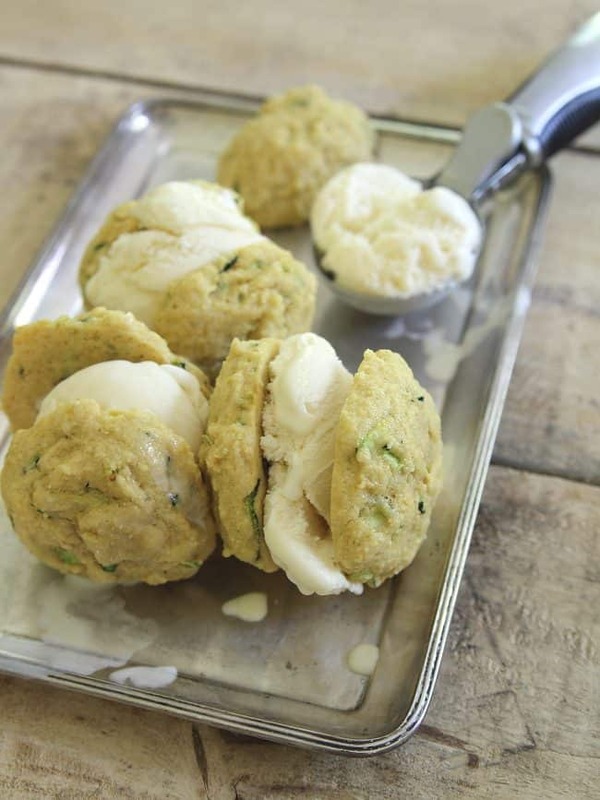 These lemon zucchini cookie ice cream sandwiches are the perfect treat to enjoy in the summer! As much as I complained while we were in the middle of the ridiculously strenuous hikes my brother planned for every.single.day of our vacation a couple of weeks ago, it was really the perfect way to kick off the summer. There’s nothing I love more than being outside in the hot summer air (and it was VERY hot in Utah and Arizona). When you spend 6 months of the year hibernating and literally shaking from the cold winters in New York, you pretty much welcome the sweat dripping off your face when you’re just standing still kind of heat in the summer with open arms. The other thing that trip kicked off was the summertime nightly ice cream routine. Of course, when you’re hiking 10+ miles every day in that kind of heat, ice cream calories don’t count. That = fact. But I don’t plan on letting that stop me from making every summer moment count and getting my ice cream fix in as much as possible. The Blue Bunny Sweet Freedom line with no sugar added is perfect for those hot summer night ice cream cravings. While the banana split, bunny tracks and butter pecan have all been sampled and thoroughly enjoyed (and Ulysses has polished off an entire box of the snack sized cones), to me, nothing beats classic vanilla. 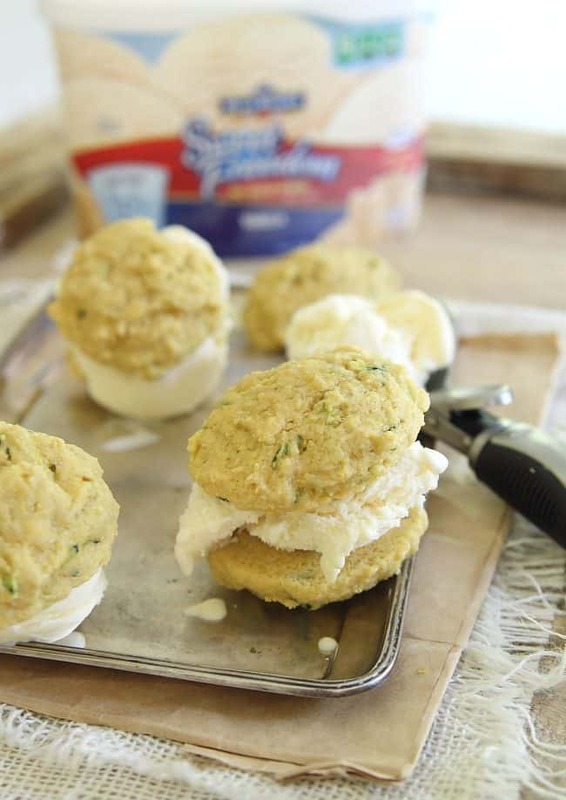 Especially when sandwiched between two lemon zucchini cookies for the perfect summer ice cream sandwich. And since there’s technically vegetables in your dessert, you can eat two. I said so. Preheat oven to 375 degrees and line a baking sheet with parchment paper or silicone baking mat. Combine the flour, cornmeal baking powder and salt in a medium bowl. In a stand mixer with the paddle attachment on medium speed, beat the sugar and butter for about 2 minutes. Add the zucchini, egg, lemon zest and lemon juice and continue beating until incorporated. Slowly add the flour to the mixer on medium-low speed until the batter is well combined. Turn the mixer off and spoon the batter onto the baking sheet in about 2 tablespoon scoops spacing the cookies out by at least 1 inch. Bake for 8-10 minutes until they're set. Once cooled, place one heaping scoop of vanilla ice cream on the bottom of one cookie and sandwich with another, pressing together gently. I love the flavor of these cookies! Perfect for ice cream sandwiches! Baking with zucchini is something I am still planning to do. These cookies look yumy! These look and sounds amazing Gina! Love the freshness of lemon and citrus in summer! Oh my gosh, these look incredible! I have all of the ingredients for the cookies, so I will have to make these ASAP! Pic of Zion? 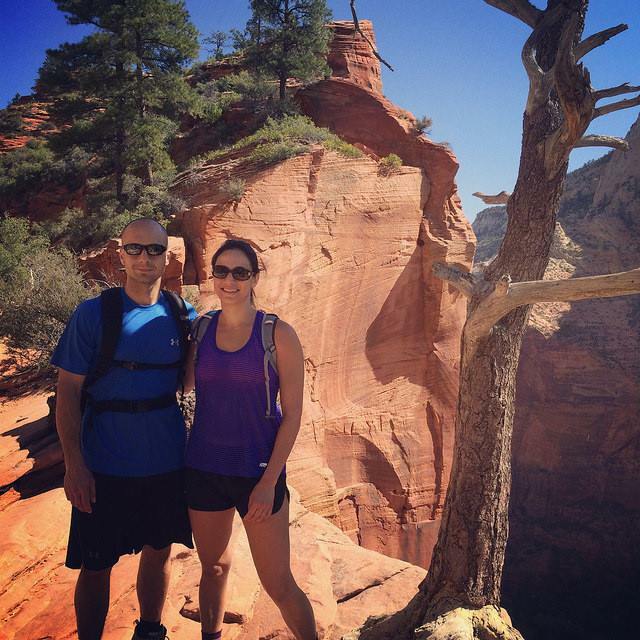 Had to ask ias it’s my favorite national park, native of Utah…living in New England and the pic made me envious! ha! Gina – this is BRILLIANT!! I’m so in love with this recipe.